In 1949, Tom Popejoy promised the University, Albuquerque and all of New Mexico that he would build a performing arts hall on the campus. He included the hall in a list of projects he intended to build for the University as he was being installed as president of UNM. Popejoy wasn’t the only person to talk about building such a hall in New Mexico. It had been a hot topic for over 20 years. If anything, Popejoy was a late arrival to the conversation. His own interest was fueled about a decade earlier while he was working in the Franklin D. Roosevelt Administration in Washington and the president asked Popejoy to attend a concert with him in New York. 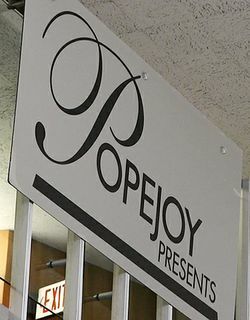 At that performance, Popejoy fell in love with live music, and especially the idea of a hall specifically built for them. Popejoy@50, a documentary about The University of New Mexico's iconic performance hall, premieres Sunday, Nov. 20 at 7 p.m. at Popejoy Hall. This is a free screening. Within a year of Popejoy’s official installation as president of The University of New Mexico, he and the Regents signed an agreement with the City of Albuquerque to work cooperatively on locating a site on which a performing arts hall would be built. Twenty years ago Popejoy introduced the Broadway series, a very popular series with more than 250,000 patrons a year coming to Popejoy Hall. However, while Popejoy wanted a hall with excellent acoustics for live performances, the city came into the deal looking for a multi-purpose hall that could accommodate conventions of up to 3,500 people, among other events. The very significant differences in intent for such a hall led to difficulty agreeing on sites. Three years later, the two parties dissolved their agreement. Popejoy continued his quest, however, and in the early 1960s he drafted a three-phase plan for a College of Fine Arts building that would offer suitable classrooms, rehearsal spaces and performance halls for budding musicians, actors, and dancers. Included in that plan was a performance hall that would seat about 2,000 patrons. 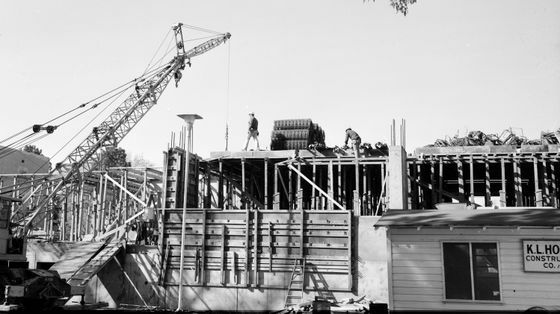 The first phase of construction, what is now the music wing of the University’s Fine Arts Center, was completed in 1964. Popejoy immediately began searching for a way to pay for Phase 2. That he did when he sold land the University owned at Lomas and Eubank. The funds from the sale, combined with $500,000 raised by a local citizens’ committee, was enough to construct the performance hall Popejoy had promised 15 years earlier. Within a year, Tom Popejoy announced he would retire in June 1968. The Regents, thankful to a man who had built so many parts of the University, wanted to show their appreciation. After all, he had built UNM Stadium, The Pit, the School of Medicine, the School of Nursing, and several dormitories and classroom buildings. They asked him to choose something they could name in his honor. He chose the concert hall. for an Oct. 1, 1966 premiere concert. In 1996, Popejoy introduced the Broadway series, a very popular series with more than 250,000 patrons a year coming to Popejoy Hall. In addition, Popejoy’s educational series, called the School Time Series, welcomes over 58,000 schoolchildren to Popejoy each season to see performances in the hall. “Many of the productions offer workshops for students in Theatre and Dance, so they can take an acting class with a professional, a dance class, a singing class, so this extends further than just the performances on stage,” said Tkach. “This gives our students the opportunity to participate with professionals." 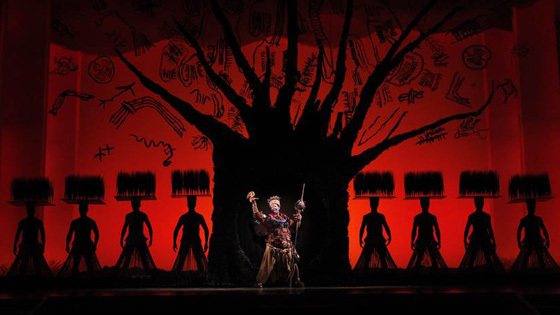 The Lion King recently concluded a month-long run at UNM’s Popejoy Hall.